Have you ever been out on a walk in the woods and stumbled upon a tiny fairy house or door? We have once or twice and it was such a fun surprise! 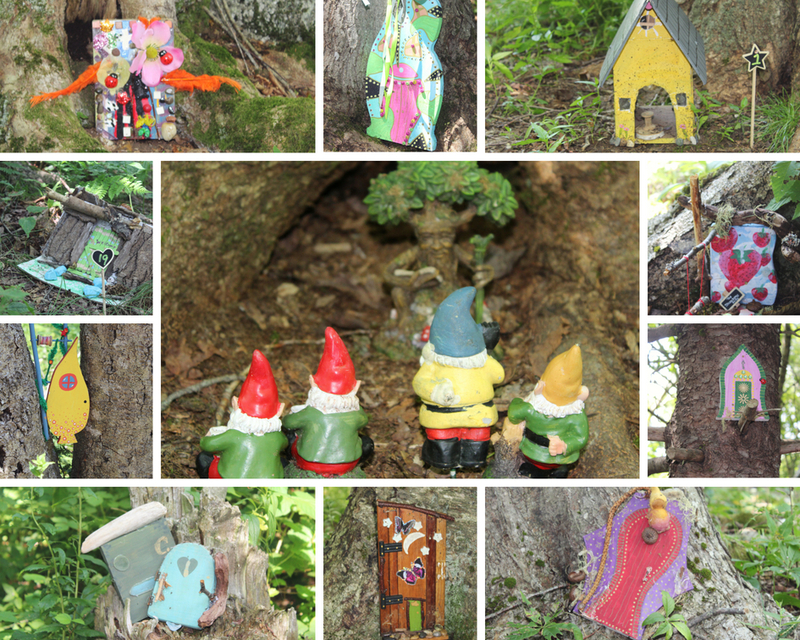 Some members of a Spryfield forest school took it one step further and created the very first dedicated fairy door trail in the city. Imagine the magic and fairy dust swirling around this little metropolis! 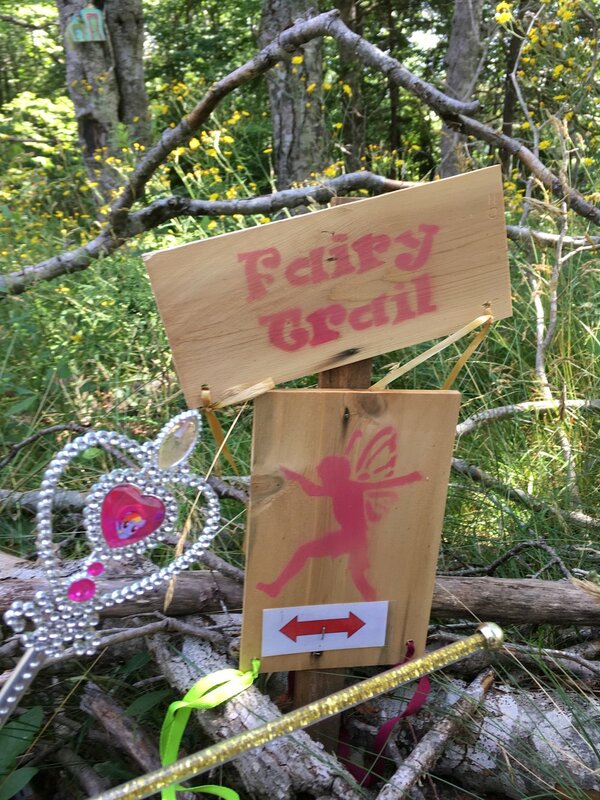 We recently saw a notice that the Captain William Spry Library branch was hosting a walk of the trail (which opened to the public on July 10) so we grabbed a couple fairy wands (you know, just in case they were needed) and went over earlier this week to check it out. The Fairy Door Trail is located in Spryfield at the Urban Farm Museum just a couple streets over from where I grew up. It was such a delight to me to visit my old stomping grounds and see an area that, as a kid, seemed a bit scary and unused now turned into a working farm, a forest school, and now a fairy door trail. It seemed cloaked in magic for me from the start. We started at the library and walked up the trail beside the skate/bike park. You should wear sneakers and be prepared for a bit of a hill - it's not super long, but it is pretty steep. Strollers are fine to push up the trail however you won't be able to take a stroller through the woods. The wooden trail is quite uneven and rugged, although it's marked with logs along the edges and there are orange balloons pinned to trees along the way so you won't get lost. They ask that visitors stay on the trail and not disturb the fairy doors (after all, if humans open a fairy door, it could lose all its magic!). We'd decorated some shells and rocks at the library so each child chose their favourite door and placed their fairy offering gently in front of it. They really thought of everything, including a little bridge you need to cross with a sign warning you that there's a sleeping troll under it so shhhh! There is also a section where visitors are encouraged to create their own fairy habitats using a selection of natural materials they've laid there to use. Some of the creations were quite impressive! I'm not sure how many fairy doors there are, definitely more than forty and it's still being added to, but you need to pay attention as they're tucked all over the forest - up high, down low, far away, very close. My daughter delighted in being one of the best spotters and showing the younger kids where each one was. There is also a forest school at the location and coming upon their camp was almost as delightful as the walk - there are fairy doors scattered around it as well as lean-tos, hammocks and stump stools. We were very careful not to disturb their camp and urge other visitors to do the same. We were lucky enough to meet these kind elves/campers who were hard at work creating more beautiful doors to add to the fairy land. This is the forest school and the group responsible for the idea. The Urban Farm Museum Society also has a working farm at the front of the trail and a shop to pick up some locally grown veggies (cash only!). Make sure you check their website and social media for current hours as they may change. We spent about thirty minutes going through the walk examining each door, and from the library parking lot to the trailhead it was about a ten minute uphill walk for the kids. Free parking is available either at the library/rec centre or on the streets nearby the trail entrance as indicated on their website. Combine it with a stop in the library, a play on their playground, and a swim in the wave pool and you've got a fantastic full summer day for the kids!